I was planning on writing this blog about New Years resolutions. The usual, be a better person, use an oven for more than just frozen pizza, finally learn how to speak spanish (fluently, not spanglish). But a strange thing happened in response to my last blog. Friends, family and acquaintances started to focus in on a single detail I breezed past. Specifically, who is this Dan person? Sorry for not introducing him, but he has his own website for that. You should check it out. The bigger question floating around was what exactly is the nature of your relationship? We are dating and running a barn together, and I can understand the confusion. In the age of digital oversharing, I am woefully behind the curve. This relationship is not ‘Facebook official,’ and I’ve never participated in #mcm (partially because I only just learned what that meant… ‘man crush monday’ to those as ill informed as myself). We have taken no selfies, and I have no instagram to fill with pictures of my ‘bae’. I fully expect a member of the Kardashian family to show up and revoke my membership to the exclusive 20-something-female club. No hard feelings, guys. I’m pretty bad at it. So, in case you haven’t gotten the picture, I’m not one to share my personal life. But it seems the personal has merged with the professional and at the strong suggestion of some friends and family, here is the story of Dan. Because I do love to tell stories. It was a group dinner at one of my favorite restaurants, Tako Sushi. Can’t remember what the occasion was, but I remember Dan was there. Dan has recently revealed that he does not, in fact, remember me being there. Naturally this revelation left me devastated, questioning the very nature of my identity. Am I not as adorable and charming as I thought? Dan went on to assure me that ‘all horse girls blend together.’ Only digging the hole deeper, buddy. But I have to grudgingly admit I see his point. Girls that ride are a dime a dozen, guys that ride are a rarer breed. With a very specific reputation, if Shania Twain’s classic ditty “Whose Bed Have Your Boots Been Under’ and eavesdropping in the stabling areas at competitions had taught me anything. So, 18 year old Kaitlin (wise beyond her years), mentally filed Dan away as cute-boy-who-rides-who-I-am-avoiding. And I continued dating the musician I was seeing at the time. Somehow I missed the memo on those guys. The next time I remember seeing Dan was at Millbrook Horse Trials in 2012. We were both in the Advanced, and I had just finished my dressage test. I was walking out of the ring when Dan came trotting around the ring, next to go. Dan looks over and asks ‘Where do we halt again?’ So I added on to my categorization. He became cute-guy-who-rides-who-I-am-avoiding-who-is-forgetful-or-very-laid-back. Little of both as it turns out. But again I filed him away and kept on dating my lacrosse player boyfriend. Nobody warned me about those guys either. This next part takes the better part of two years, as Dan and I are both very reserved, quiet people. Some would say it borders on social disorder, but I’ll be kind and just say it’s a good thing we’re both better with horses than people. But Dan trained with my boss, so we had a bit of time (over two years) to start speaking complete sentences to each other. We started chatting during lessons, waiting for our turn to jump. A sample conversation during this time: ‘Hey’ ‘Hey’ ‘It sure is (insert current weather condition)’long pause ‘Yeah’. We progressed from there. And I got to know Dan, and realize he is a pretty super person. Kind to his horses, good to his friends, surprisingly funny, and still pretty cute. Which didn’t hurt. So to bring this story into present tense there are two versions I could tell you. The first is the sobering account I’m sure our parents would want to hear. Two responsible adults sat down and made a business plan, taking into account financial risks and possible pitfalls. The second version is the one I think my friends would like to hear, which is the classic ‘and then they lived happily ever after.’ I’ll avoid either of those, as the truth is tangled somewhere in the middle. But after dating for over a year we did decide to pool our resources and hang out our shingle together. We looked for ideal locations and were lucky enough to find the beautiful Hermitage Farm in Kennett Square, PA, which will be the perfect base. You can check out the farm here. We did do the whole business plan thing, and for a moment I felt very adult. Until I sat down with my freshly installed QuickBooks and nearly threw my computer out the window. Dan talked me down. It’s a work in progress. And as far as running the barn together, its been pretty easy. The conversation went something like this: ‘I like taking excellent care of my horses’ ‘Me too.’ So that’s what we do, and I’m realizing that maybe in four years our conversation skills haven’t improved all that much. Oh well. And as for the day to day riding and training, I do my thing, Dan does his. We both have enough respect for the others way of doing things/fear of sleeping on the couch to give unsolicited advice. But watching is learning, and I think we are both benefitting from riding around each other. When the riding is done we hand over the basic barn chores to our super working students while Dan and I focus on our specific barn management talents. For example, this afternoon Dan worked on the tractor dragging the ring (because when I drive the tractor I manage to take out fence lines) and I worked on pulling some of the horses tail (because when Dan pulls tails it looks like the tail has merged with a porcupine). And now the days work is done, Dan’s watching football and I’m typing this. We’re splitting some cookie dough ice cream right out of the carton (we went to the gym earlier, its justified). Dan’s even fishing out some cookie dough just for me. So basically…happily ever after. Now that I’ve given you an idea of how I got where I’m at, I can give you some idea of where exactly that is! And seeing as I spent the first week of December doing some pretty serious relocating, this seems like a good time for a summary. If nothing else it will help remind me what zip code I’m currently in! After several caffeine fueled trips up and down I-95, I’m all settled into Aiken, SC, along with Dan Clasing, our working students, horses, and a shocking amount of stuff. Aside from confirming that I will never be a professional truck driver, the time in the truck was a bit of a welcome time for reflection. The past year has been pretty nonstop. Figuring out how to run my own barn, both the business side and training side, has been a full time endeavor. But at a fuel stop somewhere on the third trip, the fog lifted and I got a bit of clarity on what I’m looking forward to in 2016. I’ve been really lucky to work for some of the top professionals in the industry, and two things were constant no matter the discipline or barn. First was horsemanship. No two barns run exactly the same, but the quality of horse care always comes first. The second constant I’ve noticed is a bit harder name. There is a feeling in every barn I’ve worked at that you’re working for something a bit bigger than yourself. Looking back, I vaguely remember long hours and feeling exhausted. But what really stands out is being pretty inspired by the people and horses I worked with. In a sport that can rightly be seen from the outside as an individualist pursuit, this is where the team comes in. 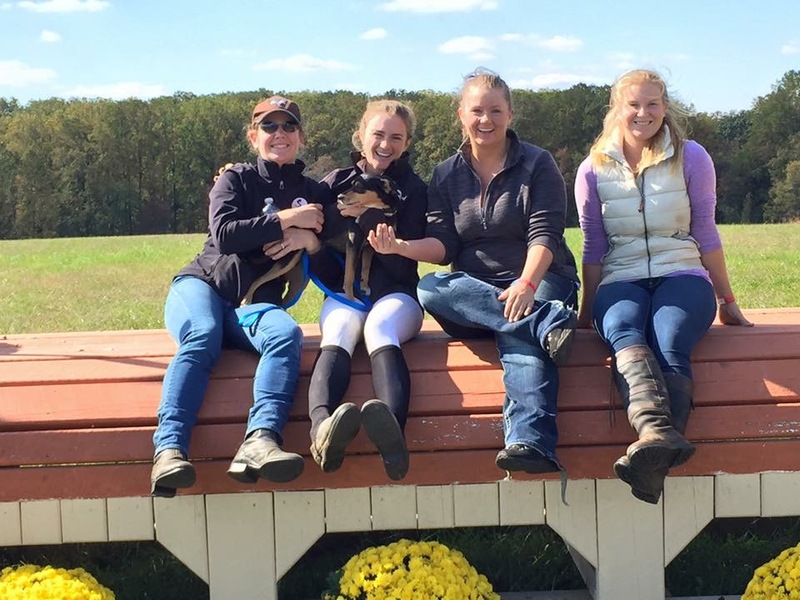 No equestrian gets to the top of their sport without a group of people who are as invested in their success as they are. And in every barn I’ve worked at, the mentality of a team was the rule not the exception. So as we settle in here in Aiken, I’m pretty excited that we have the opportunity to create that same atmosphere. The other day I was walking down the barn aisle and overheard two of our working students discussing the personalities of each of the horses in depth. It made me smile, because their observations were pretty spot on (Noodle is the hands down favorite, Cappy is the mischief maker). But more than that I loved the idea of these ambitious kids feeling as excited about my horses as I do. And as Dan and I expand and look to grow our business and increase our competitive results, I know that having people like that around is what it will take. A pretty consistent fact of training horses is that no horse has a linear progression in their training. Peaks and valleys come with the territory. Easy to say this, but occasionally hard to accept in day to day life. You can quickly find yourself questioning your true calling, wondering what other ways you can use your skills as a horseperson in the ‘real world’ as you are clearly ill equipped for training horses. In case you’re wondering, braiding tourists hair in Jamaica seems like a good way to profit from all those early morning mane braiding sessions. I may or may not have looked into the cost of a flight. But because I am a rational person who loves my job, and eventually the valleys turn back into peaks, I’ve avoided actually purchasing a ticket. This year it has also been thanks in large part to a horse called Noodle. Noodle, or Broadway Act as he’s known in more formal situations, is a six year old thoroughbred Steplin bought towards the end of 2014 for resale. He is beautiful and very quiet, a quick turnover sale seemed like a no-brainer. But as my plans for 2015 started to form and I realized my competition horses were dwindling, I decided to keep Noodle. Noodle has an incredible work-ethic, and in a barn full of divas he became my most dedicated pupil. 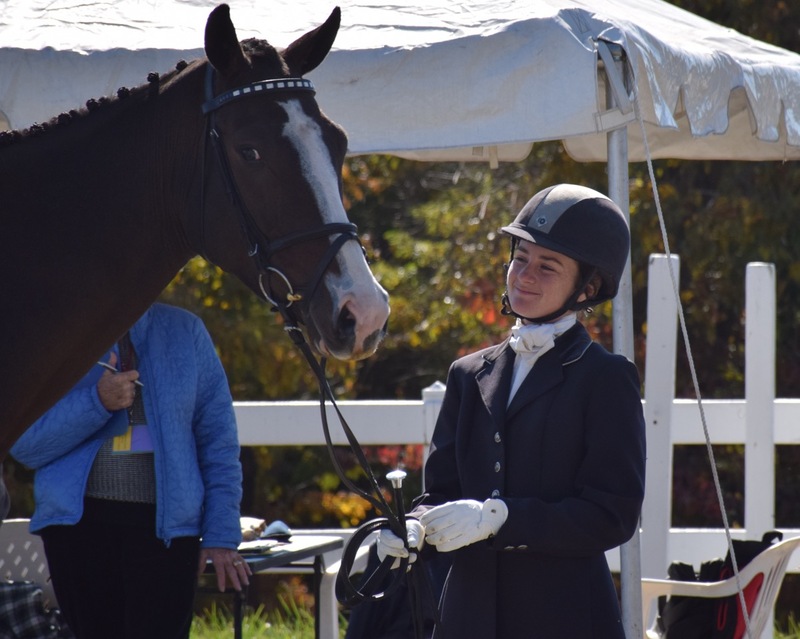 In 2015 he went from novice to his first CCI at Virginia Horse Trials, simply because he showed up every day ready to absorb whatever I wanted him to learn that day. That is a very rare and special trait. On the days when the rest of my charges seemed intent on doing their best giraffe impersonations and that flight to Jamaica starts looking pretty good, Noodle stayed eager to please and happy to help me keep my head above water. Noodle has moved back to his rightful spot on the sale list (apparently being an adult means paying bills) and while it will be sad to see him go I know he’ll carry that attitude onto his new partnership. He’s got heart, and that’s something I had nothing to do with teaching him. I have to confess, I’ve never been a fan of horse shopping. The actual process is great, who wouldn’t love an excuse to sit on a bunch of different horses? But when it comes to the actual picking a horse I’m generally at a loss. I genuinely like pretty much all horses. That is when the process starts to resemble a high stakes version of The Bachelorette. Full disclosure, I’ve never watched the show, but it seems like the girls are always picking between equally attractive, rich and charming guys. And if the longevity of the show is any indication, its not an easy choice and there are some hijinks along the way (I assume?). Anyways, that is how I feel horse shopping, except instead of roses I’m giving out a pretty big check and more than a few of my hopes and dreams. I sense a reality show in the making here. I much prefer horses that come with some sort of intervention from fate. But in 2014, fate wasn’t helping out much. I spent most of the year casually looking for a horse with no luck. I was looking at starting the 2015 season with a few sales horses and Cappy, none of whom steered reliably or jumped much bigger than a crosspole at the time. That is when I decided fate needed a bit of a push. A trip overseas seemed the best way to cast my net a bit wider, and originally I planed to call on old friends who lived abroad to travel around with me. In my head the trip resembled a mixed montage of ‘International Velvet’ and ‘Eurotrip’. Not the best idea, as it started to sound less like a horse search and more like a pub crawl. I decided I needed a proper tour guide, so I got in touch with Mike and Emma Winter of Wayfarer Eventing. Some family friends had just returned from a horse shopping trip raving about the horses Mike and Emma sourced for them, and that sounded good enough for me. Mike very kindly didn’t respond to my email with ‘who the heck are you?’ and instead set about lining up some horses to look at. I didn’t give him much to work with, as I believe my only criteria was ‘good horse’ and ‘blood type.’ He knocked it out of the park, but more on that later. I was still left without a traveling companion. But, as I do in most crisis, I called up my mom who was happy to come to the rescue. So the trip ended up resembling more of a Lifetime Original movie production, we laughed, we cried, we got lost in airports. And at the end I was left with a dilemma. I went to England with a clear mission statement: buy the highest quality horse you can afford. But Mike and Emma made that difficult as every horse they showed me was pretty spectacular. I was back in bachelorette territory. But I did come to a decision somewhere on our ill fated trip home. Our flight out of Heathrow was delayed, which meant we missed our connection in Dublin. And the only other flight to Philadelphia left out of Heathrow. Hop a flight back across the Irish Sea, land on the opposite side of the terminal from our departing international flight with nowhere enough time, and we were getting a bit desperate. My mom and I are both fairly active people, but more yoga/deep breathing than contact sport. Body checking strangers in Heathrow is not something that would come naturally to either of us. I really hope no video of our sprint across the terminal exists. But once we were safely boarded on our flight, I took advantage of the left over adrenaline to make a quick gut instinct decision on the horse search. I ended up buying a horse whose name I still haven’t found a definition or correct pronunciation for (Cartender de Nyze, your guess is as good as mine). He came with the name Tino, after his sire Caretino. Tino sounded a bit Jersey Shore for me, so I adopted the first part of his dads name and call him Carrot around the barn. I tried him twice, the first time I thought he was a really super type. But it was the second time that stuck in my mind. He hadn’t evented before, coming from a show jumping background. So I went back the second time to get him out of the ring. Turns out ‘out of the ring’ in this case meant the grounds of a castle. Horse sellers, take note. That’s how to sell a horse. But beautiful scenery aside, I was really impressed with his attitude. He was very excited to see what was around each bend. He simply seemed like a horse you could be buddies with. Its about nine months into our partnership and my opinion of him hasn’t changed. He’s a very people oriented horse, which makes working with him a pleasure. And his general excitement at life hasn’t changed. If you’re ever in a bad mood, come hang out with Carrot or watch him go. His enthusiasm is pretty infectious. All things equal, I’ll take a horse like that any day. And of course he is fabulously talented. I can’t thank Mike and Emma enough for finding me such a quality horse. I hope that his talent takes me many more places as my career and our partnership progresses, but for now I’m content that the first place Carrot brought me was on a pretty memorable trip with my mom. My mom is a fabulous horse person. So when my interest in horses didn’t fade after the pigtails and fat ponies phase she took it upon herself to make sure I understood all aspects of horsemanship. At least I think that was her reasoning for always including in my small string of horses a few projects. The first project she found me was a green broke, 4 year old, Arab, pony, chestnut, mare. I had just entered my preteen years so in retrospect it may have been less about horsemanship and more about keeping me humble. Either way it seemed to work, horsemanship and the deep humility that can only come from a good mare. She turned out great, we sold her and we’ve progressed since then. In 2014 my mom and I roped in my good friend/mentor/unbiological sister Melissa Hunsburger to start Steplin Sporthorses to find and produce quality young horses for competition and sale. And my mom’s selection has gone from ‘horses who teach life lessons’ to top quality youngsters, with some occasional overlap. This explains why at The Fork Horse Trials in 2014, about four weeks out from my Rolex debut, my mom started waving video of a bay four year old free jumping at me. And asking questions like ‘could you take one of your days off to fly out to Colorado to look at this horse? ?’ Somewhere in the space/time continuum I’m convinced there is a black hole where mother daughter relationships can freely regress at least ten years. Which explains why my response went something like *dramatic sigh ‘mom..no way…Rolex…duh’ eye roll*. So Melissa made the trek west, confirmed that as always my mom was right, he was a fabulous horse. He headed east and was rechristened Captivate, aka Cappy. It turned out Cappy had a quirky buck, which Melissa was left to deal with while I flowed through the pre-four star jitters and post-four star depression. My daily phone calls with Melissa and my mom were filled with enough melodrama to fill an episode of the real housewives as I contemplated how I could go on with life without adding a four star to my resume. Turns out its been pretty easy, but I had reached teenage girl levels of angst. Not cute! I had probably reached my most unbearable when Melissa and my mom started to talk about sending Cappy to me. I’m sure Melissa was thinking a whack on the head might do me some good while my mom was probably thinking it was about time a horse teach me another life lesson. Either way, he would give me something new to whine about! It is a huge credit to Melissa and her skill with young horses that I went a full two weeks without any bucking. Melissa had warned me, and I was beginning to think she was a bit crazy. Cappy was quiet, lazy even. I decided it was about time to pop him over some jumps. I was dating a nice Irish guy at the time and talked him into setting fences for me after work. Being Irish I’m pretty sure he was expecting some excitement, maxing out grids, racing over hedges or at least some actual jumping. But what he got instead was a lot of ‘could you put that down five holes? ?’ and ‘actually lets just make that a pile of poles on the ground.’ And Cappy wasn’t helping, casually tripping over the rails with a bored expression. Not wanting to seem like a totally wimp I went for the grand finale: ‘Lets add some filler to that crossrail.’ I’m not exactly sure what the sequence events were, but I ended up on the ground with my ego more than a little bruised. And the Irish guy wasn’t helping, laughing a bit and declaring Cappy ‘utterly useless.’ He went on, advising me to get rid of him, and fast. I didn’t respond right away, bruised ego and all plus the Irish accent made the insult adorable but difficult to understand. But when the slight to Cappy finally registered I remember thinking ‘you’re wrong, this is a super horse.’ I’d only had him for two weeks, most of which he spent standing moodily in the back of his stall, but there was something about him I really liked. Maybe it was his good looks and potential, the obvious athleticism in his buck, our shared introversion, or maybe I was just really annoyed at that guy and my slightly passive aggressive tendencies kicked in. I’ll give myself the benefit of the doubt and say it wasn’t the latter! Either way, the Rolex blues were safely in the rearview mirror and later that evening I started petitioning to move Cappy off of the ‘resale’ list for Steplin and onto the ‘keep and compete’ list. While Cappy and I haven’t exactly proved our Irish friend wrong yet, it’s a year and a half later, Cappy’s still here and the Irish guy is long gone. So at least we have that! And in that year and a half I’ve learned a bit about Cappy. He’s a character. The bucking mostly comes from anxiety, like a person with a nervous twitch. He has mostly grown out of it, and I know him well enough to know when it might happen. If he were a person he would be Sheldon from The Big Bang Theory. Incredibly smart, a bit obnoxious, and more than a little awkward. And he only has three facial expressions, happy, grumpy and deep thought, none of which you should take personally. He’s always in his own world. And finally I am still convinced he is a super horse. So convinced that earlier this fall Steplin purchased one of his siblings from breeder Kathleen Benedict of Evendoun Farm in Colorado (watch this space!). In 2016 look for Cappy to make the move up to prelim and head for a one star. And I’m sure he’ll throw in a few more life lessons along the way. As some of you may know (but most probably not because I’m terrible at sharing information!) earlier this year I went out ‘on my own.’ I wish there were a better way to word it, because the phrase is really quite misleading. It makes it sound like I did something radical and different, when in reality I just led my horses across the road to their new digs. I ride in the same ring I have for the past three years, see the same people, and pretty much have kept the same daily schedule. Not so radical! ‘On my own’ also sounds like a solo venture, and that couldn’t be further from the truth. There have been so many people who have supported me, ‘on my own’ has meant anything but alone. But I have to say the main reason I’ve been able to take this ‘on my own’ step is thanks to a lot of amazing horses both past and present. It hasn’t been a radical change, and I was incredibly supported along the way, but it was still a bit daunting to know that good, bad or indifferent, success or failure rested squarely on my shoulders at the end of the day. It took a special group of horses to make me feel like I could handle the responsibility! I’ve always heard a rider can only be as good or as brave as the horse they are sitting on. For me that started with ponies, who gave me the confidence to stop, steer and most importantly get back on. From there came a series of horses that got me through all of my firsts: first pony club rating, first event, first big mistake, first Advanced, first four star. They made me brave enough to try, and they were kind enough to teach me what I was capable of. And now its horses that make me brave enough to say things like ‘I am a professional who wants to compete at the top level’ and feel like I have horses that can back that statement up. So rather than spend these first few blogs telling you too much about myself (I’m a bit boring) or my goals (run fast, jump big, pretty much sums it up) I’d like to tell the stories of how some of these horses came into my life. Specifically the three that came around this past year. Without them I never would have been brave enough to take this step.